← Leader or attachment figure? Equestrian art is the perfect understanding between the rider and his horse. 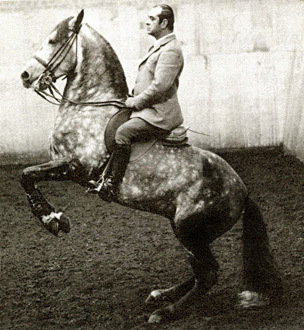 This harmony allows the horse to work without any contraction in his joints or in his muscles, permitting him to carry out all movements with mental and physical enjoyment as well as with suppleness and rhythm. The horse is then a partner, rather than a slave who is enforced to obey a rigid master by constraint. To practice equestrian art is to establish a conversation on a higher level with the horse; a dialogue or courtesy and finesse. The rider obtains the collaboration of the horse by the slightest hint of a demand, and the spectator can then see the sublime beauty of this communion. He will be touched by the grace and form, and captivated as if he were hearing the most grandiose music. …It is at this point that a conversation on a higher plane becomes established which the horse will never forget, even if separated for a long time from his rider. He will reply to this conversation easily the day that he is reunited with his pedagogue. This entry was posted in Classical Training and Philosophy and tagged collaboration, Equestrian art, finesse, grace, harmony, Nuno Oliveira, partnership, rhythm, suppleness. Bookmark the permalink.